I’m sure US companies will be coming home to America to provide more jobs with the help of Obamacare and all its advantages; lower “insurance” premiums, equality of treatment of all individuals and companies and entities, increased privacy and security, more doctors and hospitals and healthcare providers. . . NOT. No worries, Texas. I hear that Obama is working up a plan to take all the millions of dollars that were saved on green energy and convert them into Obamamiles, so that US workers can fly at a low cost to the Netherlands and Ireland for work. Now don’t you hear that Guiness callin yer name? Having read this, I’m a bit confused concerning the objective of the post. I see a couple of people shared it on their blogs as well. I checked for comments on the other blogs too, but saw nothing to clear up my confusion. Is this a post about “Obamacare” or about corporate tax rates? It very well could be about both, since I suspect the high cost of employer subsidized health insurance is as harmful to many businesses as the corporate tax. Possibly the biggest distraction has been the implementation of “Obamacare”, and to what end? The “wealth transfer” in the private insurance market has been going on for decades. “Obamacare” is a compromise to allow the insurers to continue to get their piece of the pie, and they are pretty smart guys and gals. They realize that even with their administrative fees capped, they will clean up as more and more people enroll. Steve, I should have explained my synaptic leap more clearly. Charles hit the nail on the head. Thank you. French philosopher Frederic Bastiat explained the basic laws of economics in 1848. In “The Law”, Bastiat explained in layman’s terms anything government does, takes capital away from individuals, and thereby choice and liberty. Corporations do not pay any taxes. Corporate taxes are nefarious for they “hide” the true tax rates “the people” actually pay out of their own pocket. The corporation’s customers pay the hidden taxes through unnecessary higher prices, which can be considered a “hidden tax” which also raises the sales price upon which other taxes are calculated. Meanwhile the corporation’s shareholders are taxed at least 2x’s, once at the corporate level, and then again when they receive their dividend. Consequently taxing corporations results in at least double taxation, or more likely quadrupling or some higher multiple. Regulations and mandates by government requiring corporations to spend money not necessary to the production of the product or service are also burdens, or “taxes”. Obamacare is already causing corporations who compete in the global market place to scale back and or flee America, which also reduces the tax base, as fewer employers equals fewer employed paying fewer taxes. And all top of all the taxes? Now consider the lost increase in spending power that purchasers could have built through buying products instead of paying taxes. Spending is an exponential function increasing productivity just as taxation is an exponential function stealing from all levels of the economy. Those in leadership and government understand these basic concepts, and that they are destroying the people’s individual opportunities for accumulation for wealth. Everyone should be asking the question why does government want everyone to be poor? It is late, at least for me on a Sunday. 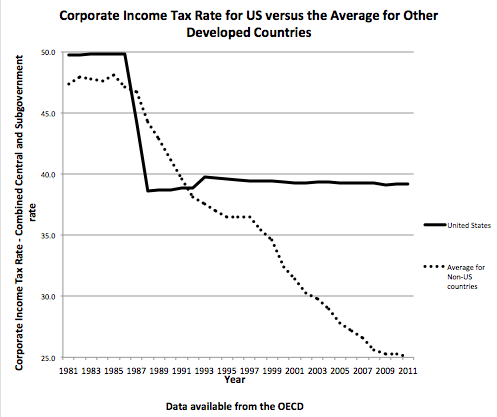 So…corporations do not pay squat in taxes. Leaving? Re-incorporating? Immigration reform coupled with single payer system promises, keep what is left to pick off here. The rest is colored bubbles. Please see the discussion above and my comment. As corporations compete for customers and investors simultaneously, I totally agree that the corporate tax is simply passed on to consumers. Concerning “Obamacare”, the best outcome would be for all businesses to stop subsidizing their employees’ healthcare. Instead of reducing employee hours to skirt the law, I would rather they drop their plans altogether. For “Obamacare” to have a chance of succeeding, universal coverage is required. If it fails, I’m afraid we are only a short ways from a single-payer system. “Obamacare” is designed to prevent this. I also agree tax a corporate tax results in double taxation. Only distribution to owners should be taxed, but I advocate taxing dividends as ordinary income. We can say that the answer is a reduction in spending, and I agree there is a lot of room for improvement, but I believe a more important component is broadening the tax base. That can occur by increasing the number of jobs, and the wages paid. Even if there were no reduction in real spending, the top 1% will pay a smaller percentage of the total bill when working folks are able to pick up a bigger share. What I see happening is this: Investors seek the highest returns by shipping jobs overseas and paying politicians to maintain preferential tax rates on investment income.